Over 12,000 people came to the Hyatt Regency O’hare and Stephens Convention Center over the past few days for a weekend of cosplaying, vendors, events, and guests. In order to provide a fun environment that stays safe all weekend, AnimeCon.org invests in hired security and our own staff to guard entrances and check that everyone there is someone okay to be there. With the recent trends in news and happenings around the world, combined with the fact that there were other conventions happening in the same city, Anime Midwest/AnimeCon.org decided to increase security, by checking all the entrances to convention areas, including hotel lobbies and other areas that attendees tended to congregate in large amounts. The overwhelming majority of the people coming buy badges to attend, and can get past security checkpoints without issue. Most of those that don’t want to purchase a badge, or can’t, will attend by working for a vendor for the weekend, joining staff, or applying to do panels to get a free badge for the weekend. It’s just generally accepted that to be part of the convention experience, you get a badge. But all these security measures brought a new issue to the forefront. It may be surprising to learn, some people come to a convention intent on not getting a badge for the event. Perhaps 80 people, compared to 12,000 people who intended on getting badges. Sometimes they come up with clever names for this, such as “lobbycon” or “ghosting”. Over this past weekend, many of these “ghost” people were surprised by the number of security officers and badge checkers at Anime Midwest over the weekend. In other parts of the country, it may be surprising to suggest that anyone attending might not have a badge. Some of the largest conventions in the world are held in massive expo centers, with paid security at every entrance – there is no place to “hang out” except behind this security. In the past, Rosemont/Chicago has been a little different, because of the layout of the venues. Most conventions in the area are spread out among different venues, including hotels and convention centers, which doubles the number of entrances to check if you want to check everyone entering. And for many years, people would be able to “hang out” without getting a badge. But I’ve written about this before about why you should not come to a convention without a badge. With recent world trends, we decided to be extra proactive, and keep anyone without a badge out of our major congregation areas. We told our outside hired security staff to be as polite as possible, and to offer helpful directions to badge pickup areas. We also asked them to provide exceptions through the main doors to people who are likely to have other non-con business in the hotel, including businesspeople in suits, families with children, et cetera. A handful of people came to the convention, dressed up in cosplay, without badges, and we had to kick them out. Some of them stated that they had hotel rooms, assuming that included access to hang out in cosplay areas, and we had to let them know that was not the case. We had no problem with them returning to their rooms and hanging out there. Our staff also offered to show them to the information desk, where we could issue their badge instantly and without waiting in line, to make it even more convenient. I estimate we kicked out only about five or six “groups” that seemed clustered together intending not to get a badge. But, back in my other article, I write that a key reason to get a badge is that badgeless people are quite often much more trouble than people with badges. They feel no accountability, and can cause harassment or damage to the convention, without being held accountable for their actions. And this weekend’s statistics don’t lie. Another anime convention happens in the same venue every year, and is much more lenient on badging – and so there are many people visiting without badges. I’m told this year, they had almost ten ambulances called to that different anime convention before their Friday dance began. Over the weekend ten per day would have made almost thirty ambulances. Anime Midwest had a total of two ambulance calls over the weekend. That is an incredible difference in dangerous or medical situations – and one of many key differences in the two conventions, is how we handle our lobby congregation areas. The first ambulance at Midwest was due to a fight between two men in someone’s private hotel room, and the second call was for a sprained ankle. This isn’t to throw shade on this other convention – many of their staff and attendees are wonderful people. But there is a different security culture. Overall, requiring everyone attending to have badges, and posting security officers at every entrance, greatly increased the security for our paying attendees at Anime Midwest. Sadly, some of these people without badges decided to take their complaints online. We kept them from entering a paid event without a ticket, and they’ve decided to call it harassment. We were told this is such news, that a pop culture news website would be covering it. We are happy to share any details we are able or answer any questions they have. You can’t attend a Shakira concert for free. Hanging out with friends, in cosplay, in major convention lobbies is a big part of the convention experience – it’s not free either. We have many congoers hanging out in the lobby. We have medical staff to respond to incidents – if someone passes out from dehydration, gets harassed by another attendee, or has a medical emergency, we’re keeping them safe – above and beyond what these venues would normally provide. Paying for supplies and people to keep them safe costs the convention money, and so spending time in major lobbies is not something that is free. In general, people attending without badges is not a large amount of people, and most people are happy to get a badge to attend an event. 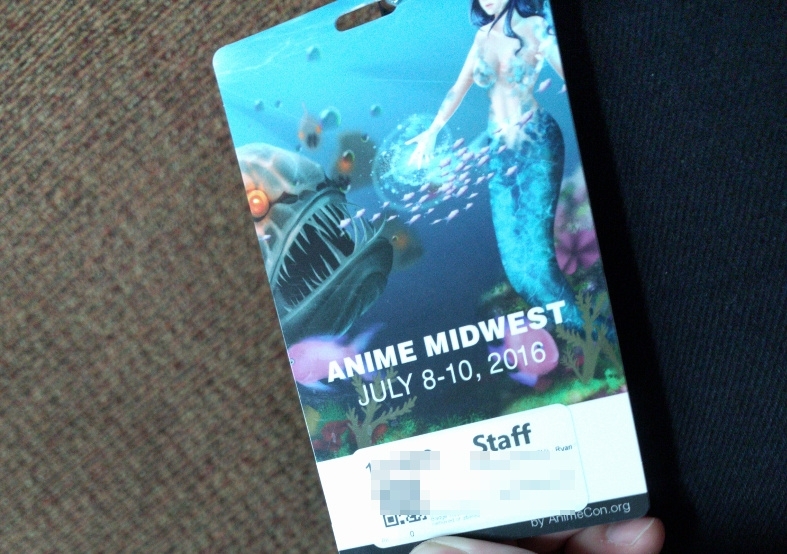 And overall, we had a fun, safe weekend in Chicago with thousands of other anime fans. Update 1: Hotel lobbies are not public space during a convention. This is a common misconception. Any hotel staff that have stated otherwise may simply not have been updated or were trying to help a frustrated guest. Next year we may offer wristbands to hotel guests for access to more areas. With all the recent violence, the goal is to know everyone in the area. Update 2: Comments that are not constructive or encourage people to go to events without badges will be deleted. Update 3: A handful of comments have been deleted saying that hotel lobbies are public space, as they are not. See Update 1. We are considering giving anyone with a hotel room in 2017 an optional wristband for access to the lobby. Update 4: There were so many questions and thoughts in response to this article, I wrote a follow up article with more information. Read the follow up for more information.